Everyone hates popups. They clutter your browser, jump up at the worst possible moment, and drive your visitors crazy. But what if you could get the converting power of a popup without annoying your visitors? To accomplish this we’ve created the free Infusionsoft Exit Optin plugin for WordPress. To get started, you’ll also need our free Infusionsoft SDK plugin that provides access to the Infusionsoft API. 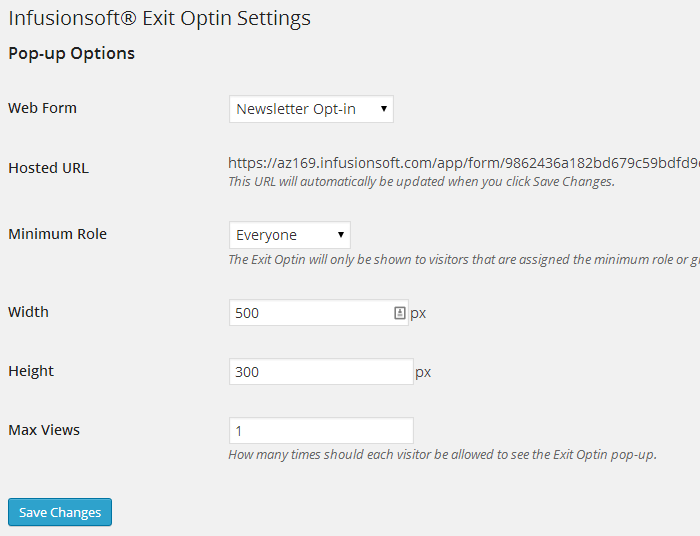 Infusionsoft Exit Optin works by showing a web form in an in-page popup but only when the visitor tries to leave the page. This is called “exit intent”. When their mouse leaves the main content area of the browser, the popup will appear. This isn’t annoying to the visitor because they are likely already leaving your page, and they aren’t forced to interact with the popup before they can leave. They can click anywhere on the page to close the popup, or hit escape, or click the X. Because the plugin uses web forms, you can easily use your popup with an Infusionsoft campaign. It is also easy to style your web form, add images, and change the text from within Infusionsoft. Your changes are instantly reflected on your website. First you choose which web form you want to use for your popup. This list is automatically loaded from your Infusionsoft app via the API. Next, choose the minimum role your visitor must have in order to see the popup. This lets you hide the popup from visitors while you are configuring and testing it. Last, choose the width and height of the popup, and choose how many times each visitor can see the popup. Want to know what Novak Solutions can do for you? Schedule a call with us and we’ll help you automate your business! Hi Jacob, thanks for awesome plugin! Would there be a way to only show popup to those who have not subscribed yet? As its annoying to show to people who have already subscribed. Could you do it by IP Address perhaps? I’m assuming Infusionsoft collects ip address and adds to a contact record when subscribing. i.e. check via infusionsoft API whether this ip address/contact is already subscribed, and if so, not to show the popup. Do you think this would be doable? That isn’t currently an option, but it is definitely on the roadmap. It is a bit tricky because Infusionsoft doesn’t store the contact’s IP address, and the cookie they set is only accessible from their domain name. I’ll probably end up making it possible to set a cookie on the subscription thank you page at your blog, which would then be used by the popup to find out if a contact is already subscribed.